We are born into families. We die inside or are exiled from our families. 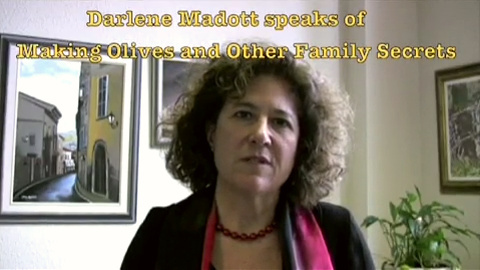 I began writing "Making Olives" at the age of 26, and could only complete this story at the age of 55, when I finally came to understand meanings that take generations to unfold. Some inhibition resulted in essentially twenty years of silence, after my first collection of short stories, Bottled Roses. "You have to crack them open, devi schiacciarle - crack them open, so they can absorb the sweetness of life." When my Sicilian aunt gave me this recipe for making olives, I thought instantly of my Calabrian Aunt Flo. She was one, who like the olives, had been schiacciata by life. Possessed of a legendary beauty that was quite gone by the time I knew her, Flo had a good many suitors - men who later gave decent lives to their women, but my Aunt Flo gave herself to Ercole. Uncle Ercole was a rude man who rolled putrid cigars wetly between his lips and buffed his teeth after dinner with a folded serviette. Uncle Ercole had made Aunt Flo pregnant before making her his bride. But Flo, astonishingly, was without shame. She simply refused to mourn her life. On the day our youngest sister was being born, my oldest sister and I went to stay with my Aunt Flo. Our father drove us over early in the morning, just as the sun began to rise. Flo greeted us in the kitchen. She wore a pink floral housedress, the brassiere strap dangling on her arm. Her own children were long grown and gone from the house. We had the whole house to ourselves, and Aunt Flo. Flo played with my older sister and me. I mean, she really played with us, as if there were no difference in our ages or imaginations. From a deep bottom drawer filled with costume jewelry, she pulled out the colored strands of beads, roped these around our necks, and showed us how to dance "the Charleston." For lunch, we gorged ourselves on black olives. When our father came to pick us up, I was being sick on the black olives. "What happened to the money I gave you to make them a proper lunch?" Aunt Flo looked like a child being chastised. I wished so much my father would not be so angry with her. It was my first intuition of an odds between one adult and the rest of the grown-up world. "Don't you know your pain is no different than anyone else's," my sister said to me, the winter of my separation, after I had made my own first mistake with the likes of an Uncle Ercole - a man just as abusive, although he came polished and wearing a business suit. I am told that when I laughed at the altar (how this man had hated my laugh) the wedding guests had heard the laughter of my Aunt Flo. "No one wants to hear you," my sister said to me after the failure of my marriage, "or don't you know yet?" I wanted to tell my older sister then, as I do now: It is not the pain that defines us, but rather our response to it. I will eat olives. I will eat olives as long as I can, as many as I can get. I will eat them to excess, even if eating them should make me sick. I will allow life to crack me open, so that I can absorb the salt, the sweetness of it. I will risk making them, over and over again, just like my mistakes. I will do this in memory of my godmother, my very own Aunt Flo -- e' stata schiacciata della vita. 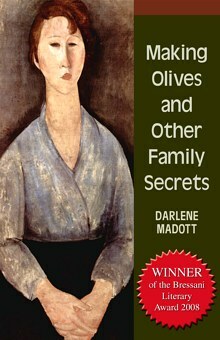 Cracked, she had been like the olive, but like the olive cured in salt water, had absorbed all the sweetness of life.